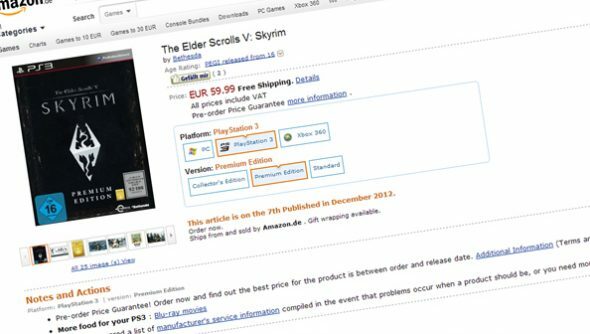 We’re not exactly sure what Skyrim’s Premium Edition is yet. Here’s what little we know: It’s arrived on Amazon Germany for 60 euros, with a release date of December 7th. It includes a map, a t-shirt featuring Imperial insignia, tie-in novel Hell City and six concept art postcards to send to faraway relatives in Riften and Markarth. Not much to go on. But we’re all over it because, crucially, there’s more of it on PC. Premium Edition PC comes with a bonus disc, which incorporates “exciting” background material, trailers and walkthrough presentations. In addition, it includes the 600-odd page Official Guide as an ebook and five songs from the game’s superb soundtrack. Bethesda have told Eurogamer that it’ll see a UK release too. No word yet on what DLC will be included, if any.